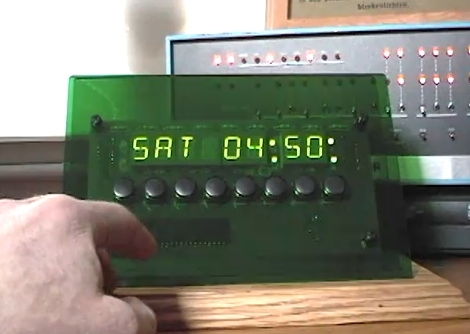 [Bob Alexander] admits that he over-engineered his clock, giving it eight control buttons, eight twelve-segment alpha-numeric display digits, a GPS module as a time source, and a beefy microcontroller to boot. But he’s found a way to get more for his money out of the device by adding RSS and weather features to it. Since he’s using the PIC 18F4550 it’s a snap to add USB connectivity. From there he wrote a fantastic PC-side application for communicating with the display. Now he has the option of displaying time, RSS feeds, or weather by scrolling through the options with one of the buttons. Perhaps the best feature is the option to launch a browser on the PC and view the current story just by pressing a button on the display. Check out the two demos after the break; one shows the clock features and the other demonstrates the C# software. [Barney_1] built this sereial RSS reader. He’s using the Dragon Rider 500 development board, which is a kit that has expansions available including the LCD, serial interface, and power supply. You don’t need the kit though, you could just build your own with similar specs. He has written a program in python to scrape RSS feeds and send them to the LCD. He’s got some specific workarounds for the Dragon Rider board if you do have one. You can download the firmware and source code on his site. You can see a video of it after the break.